A set of old-fashioned window shutters can increase your house’s curb appeal and give it a cozy, cottage-like feel. These shutters can be purchased from most home improvement stores, though they can be expensive. Instead of spending hundreds of dollars on shutters for your home, consider making them yourself. Like any good do-it-yourself project, this will also ensure that you end up with the kind of shutters that work best for your home. There are a few different shutter styles out there, but the easiest to build are board-and-batten shutters. These are relatively simple and cheap to make, and they look good on most windows and homes. To make board-and-batten shutters, you will need three 1-by-4 inch boards for each shutter screwed to two cross pieces located 8 inches from the top and bottom edges. The cross pieces are called battens, hence the name board-and-batten shutters. After the boards and battens are cut to the correct length and sanded, two screws are used for each batten to attach them to the boards. For best results, the boards should be held together with bar clamps until the battens are attached. This will create a tight fit between the boards. The battens should also be screwed into the boards from the back of the shutters so that they cannot be seen once the shutters themselves are installed. You should also pre-drill the holes for the screws at an upward angle to prevent water from seeping into the holes. 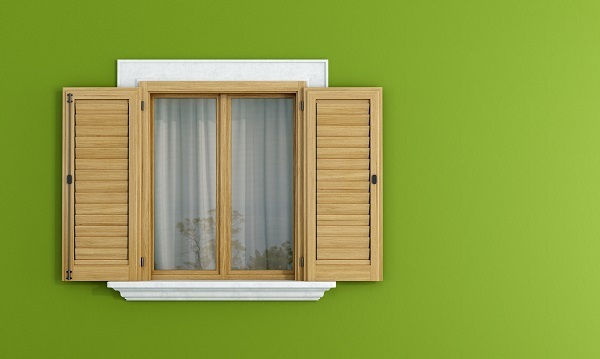 If you have wider windows and need shutters to match, you can also use more than three boards and longer battens. Since one of the appeals of board-and-batten shutters is that they are so simple and versatile, they can be constructed to be as wide or narrow as you want. You can also increase their width by leaving gaps between the boards. This is slightly more difficult than building them with a tight fit, but it can be done. Once again, it’s all about creating the look you want. One of the best things about do-it-yourself shutters is that they are inexpensive to make. These shutters can be as simple or elaborate as you want them to be, but a basic set of shutters will cost between $200 and $250 to build. This includes about ten wooden boards (pine works best), some rust-proof deck screws, shellac-based primer, a quart of exterior paint, and two decorative hinges per shutter, although you can also buy functional hinges if you want your shutters to be more than merely decorative. A set of board-and-batten shutters can be the perfect way to give your home a quaint, cottage-like feel, and they are incredibly easy to put together. They are also fairly customizable and allow you to make a set of shutters perfect for your home and the look you want to create. Remember this simple project the next time you want to add some curb appeal to your home. This article was written by father and home handyman Jared Miret. Another way to keep your windows looking great are new custom windows from Home Exterior Systems.